Paradigm® will present a multi-disciplinary program targeted at the trends and challenges facing today’s energy industry, at the 100th American Association of Petroleum Geologists (AAPG) Annual Convention and Exhibition, in Houston, April 2-5. The company will host a media event on Monday, April 3 at 2:45 pm CST, at the Paradigm booth, to unveil Paradigm 17®, its latest software suite. Conference attendees are also invited to join Paradigm at booth #1715 for live demonstrations featuring the latest innovations that help fuel global energy programs. 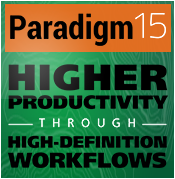 With the theme A High Definition Platform – Better Results with Less Effort as a backdrop, Paradigm technical presentations will feature the new Paradigm 17 product suite, which leverages a high-definition platform along with advanced technology and seamless integration, to improve asset team effectiveness in achieving superior decision-making results. This latest software suite is also available for use on the Cloud. AAPG attendees can attend live software demonstrations each day, starting at 9:30 AM. One-on-one demonstrations by technical experts featuring the company’s latest technology offerings and its potential applications are available upon request. Click below to view Paradigm's complete program at AAPG.